APRC held a very successful forum in Melbourne on October 10th, 2015. 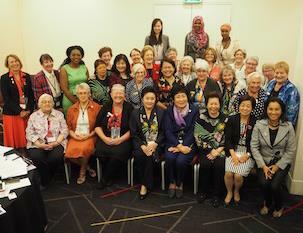 The theme of the forum was “Women and the Economy in Asia and the Pacific”. This forum was followed by the National Council of Australia’s Triennial Conference and the launch of the book, The Radicals. We have been very fortunate to have our ICW President, Dr. Jungsook Kim attend both events. In spite of the tight schedule, we managed to have some very interesting speakers from the Asia Pacific region. Thanks to ICW, we managed to have a speaker from Fiji. APRC President, Dr. Monthip Sriratana Tabucanon welcomed all the participants. In her welcoming speech, Dr. Jungsook Kim said that ICW has done so much for promoting the status of women and protecting the international human rights of women for the past 127 years. ICW always there whenever women’s issues had to be discussed and reflected to achieve gender equality. ICW has long been at the epicenter of the global women’s movement, improving the lives of virtually billions of women in every corner of the world. Even though progress has been made since ICW was established in 1888, we still have a long way to go to realize true gender equality. The first speaker, Ms. Shelley Siu from Singapore Shawl, had a very unusual presentation. The title of her talk was “Skills and Capacity Building”. Instead of the usual talking to the audience, she let her shawls do the talking. Next, Mrs. Bida Darmadi from Indonesia, presented “Access to Markets” on behalf of Dr. Giwo Rubianto Wiyogo, President of NCW Indonesia (KOWANI). Mrs. Darmadi explained KOWANI’s point of views toward the ASEAN free market access to women. Dr. Monthip Sriratana Tabucanon from Thailand, presented “Innovation and Technology”, focusing on the normative frameworks on ICTS and women’s empowerment. After lunch, Rae Duff, President of NCW New Zealand, spoke on NCWNZ and legislative changes in New Zealand, specifically, the 2003 Prostitution Reform Bill, the 1995 Domestic Violence Act, paid parental leave, and gender pay gap. After another presentation by Julie Morris from Australia and Irene Goonan of BPW on “Pathways and Freeways”, Dr. Monthip Sriratana Tabacanon talked about APRC Plans and Vision. The last speaker, Lorraine Foster from Fiji, spoke on “Government aid and assistance”, focusing on climate change and its effects on the Pacific Island countries. Dr. Anamah Tan rounded up the session, which ended successfully.